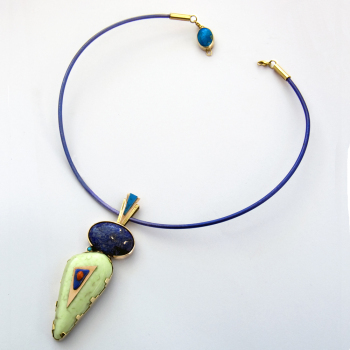 Type: Choker necklace constructed with the aid of the overlay technique (Edition of one); belongs to the Manidoo series. 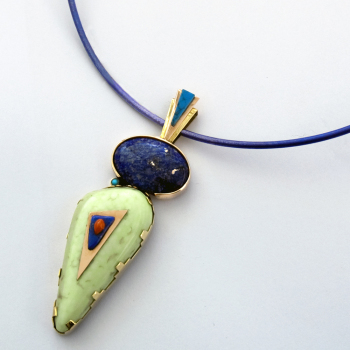 Materials: Blue titanium choker necklace with 14K gold tube-fastening including a 18K and sterling silver double-sided detachable clasp set with turquoise; pendant of 18K and 14K gold and sterling silver set with Australian citron chrysoprase, lapis lazuli, turquoise, red coral. "A variety of colorful materials adorns the front of this figure pendant in the dramatic style of contemporary Dine' (Navajo) and Hopi jewelry, while the reverse side is carried out in the graphic style of the Anishinaabe Medicine Painters – characterized by simple, flowing lines and pictographic-like patterns set against a light background. As an artist and jewelry maker I try to maintain as much Anishinaabe spirit as I can in my design. My underlying motivation is always to translate the ancient stories and world view of my ancestors into visual representations that can be universally appreciated. Besides drawing on these oral and pictographic traditions, I also consider it a challenge to mirror myself in the rich diversity of contemporary jewelry from the American Southwest - and at the same time find MY OWN PLACE AND STYLE in the continuum of Native jewelry making traditions. 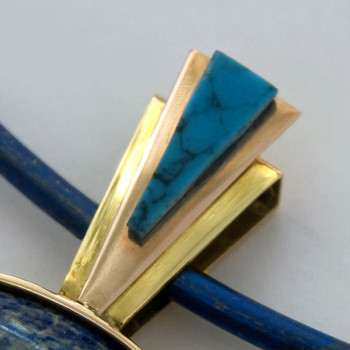 This inherent paradox – a contradiction between drawing from ancestral tradition and working on the edge of contemporary jewelry art - resulted in the creation of the Manidoo or ‘Spirits’ series, mostly necklaces and bracelets fashioned in the tradition of the late master goldsmith Charles Loloma. Charles Loloma, who belonged to the Badger Clan of the Hopi people, was probably the first Native artist to create abstracted faces of Kat'sinas (benevolent spirit beings) and Corn Maidens, which I constructed from unusual materials like blue titanium for the collar necklace and a light green chrysoprase stone (set in 18K gold) representing the body of Sky Spirit Woman, reflects this contrast between two different Native traditions on the one hand and between ancient Native expression and highly contemporary, universal expression on the other hand. This concept of ‘two-sideness’ is expressed by a front side that, in its colorful extroversion, is reminiscent of the contemporary Southwestern style of Loloma and a reverse side that is characterized by a “northerly” fashion, more in keeping with the “spirit writing” tradition of Anishinaabe Mazinaajimowin, or Ojibwe pictographic imagery. 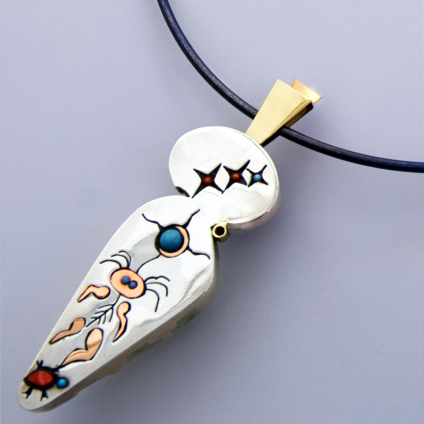 Within this context of abstract symbolism and narrative Anishinaabe representation, I depicted on the back side of the pendant, with the aid of the overlay technique, the traditional story of how Sky-Spirit Woman recreated the Earth. I hope you like and enjoy this piece." “The first mother of the Anishinaabeg was once an aadizookaan, a supernatural being residing alone in the sky. Her name was Giizhigookwe, or Sky Woman. GICHI-MANIDOO, the Creator of Earth and Skies, sent a male aadizookaan to Sky Woman to keep her company. Animikii (Thunder), for that was his name, traveled to the lodge of Sky Woman and from the union that took place (rumor has it that Sky Woman showed her lover every hole and corner of the universe!) were born the ANISH-I-NAAB-EG (a twin brother and sister), whom she placed on the back of a giant Mikinaak (snapping turtle). 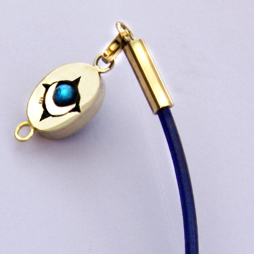 The above image shows the backside of the pendant, an overlay design consisting of a sterling silver plate with a design cut out and soldered on top of a another plate of the same material. 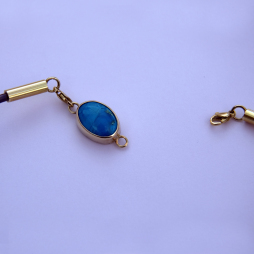 This ‘negative’ design, which was darkened (oxidized) with the aid of a sulphur solution, I furnished with inlay of red gold, turquoise stones, and red gold. The design depicts the sacred story of how Sky-Spirit Woman, after giving birth to the first two human beings (anish-i-naab-eg) on top of the shell of a giant turtle, ascends back into the sky, which is the domain of the sun, the moon and the star spirits. An island was formed on the back shield of the turtle – represented by the red of the inlaid coral cabochon; this island would soon become known as Mishi Makinaakong, the place of the Great Turtle’s back (now known as MICHILIMACKINAC) and, taken in a wider sense, as the continent of North America, which is still being called TURTLE ISLAND by its indigenous inhabitants.